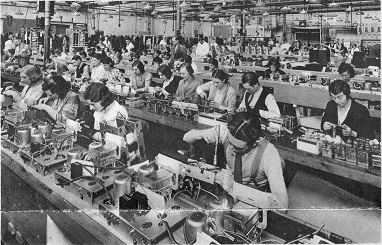 Although they produced valves from the earliest days they didn't really get involved in Radio manufacture until the late 1920's with the 1927 Melody Maker. 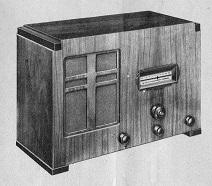 This site is mostly about Domestic Radio and Radio Kits Cossor were especially known for the Melody Maker, this title was used from the earlist kits in 1927 to the mid 1950's on kit sets and budget sets never let it be said that Cossor wasted any residual loyalty to the brand. Below we see a model 494 on the Cossor Stand at Radiolympia 1949 and also on the stand is the 1927 Melody Maker kit set. The Sales team seem to have wanted to show the continuity and development of the Melody Maker . 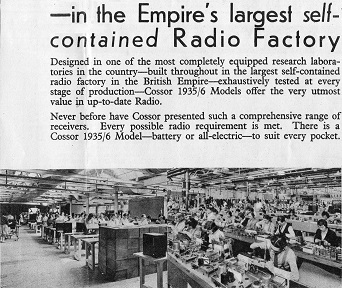 Cossors Boast in 1935 that their sets were built in the Empires largest self Contained Radio Factory. It looks as if production line in the foreground could be this model the 435B. 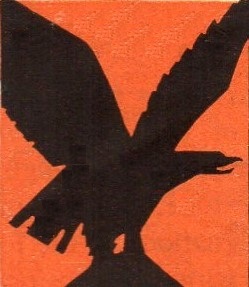 In 1934 Cossor claimed to have 5 self contained factories. Cossor originaly manufactures Scientific glassware but is but was from the very early days was involved in Cathode Ray Tubes and Thermionic Vacuum Tubes. 1937 Receivers for the Chain Home primary radar system, the world's first radar air defence system, are built by Cossor. Cossor disposed of it's Radio and TV buisiness to Philips in 1958 having already dispossed of its remaining interests in ETEL around 1956.